One of the most unusual map stamps was issued by India in 2000 to commemorate the 50th anniversary of the creation of the state of India. India had been a British colony and Mohandas Karamchand Gandhi was instrumental in shaping the emergence from colonial status to statehood. 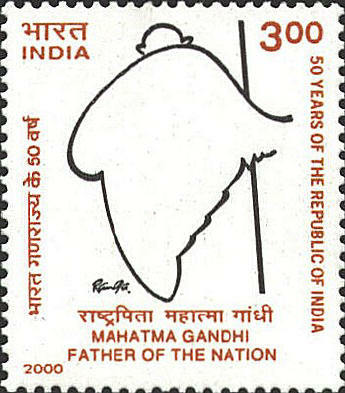 The stamp designed by Sri Ranga shows Gandhi as a silhouette in the shape of outline of India. Gandhi, the Father of the Nation, is represented as the nation itself. "Mahatma" is a title of honor, "Great Soul."